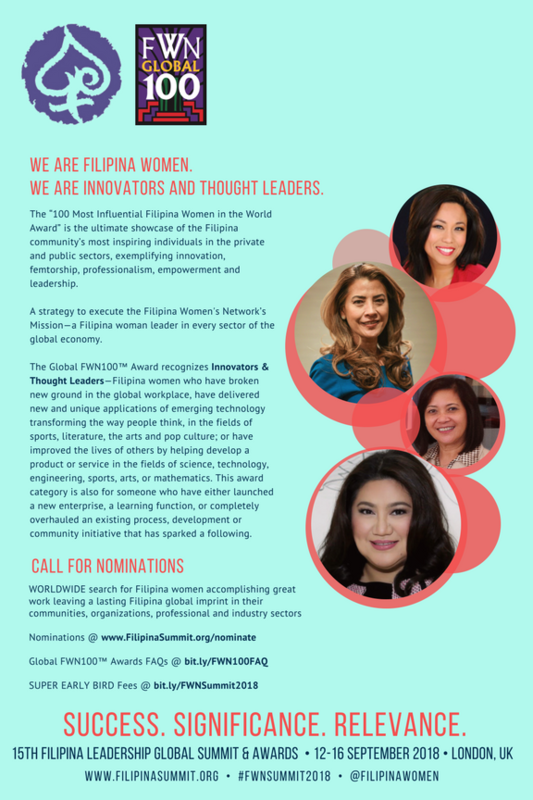 The search for the 100 Most Influential Filipina Women in the World is on! Do you know a Filipina woman who is fearless, passionate, purpose-driven, socially conscious, and making a profound impact in the community? A Filipina woman who is a forward-looking leader championing an innovative, groundbreaking project that benefits the lives of others in your organization? A Filipina woman in diaspora who is thriving amidst the many challenges of working and living in the multicultural global economy? A #FilipinaDisrupter who is breaking the glass ceiling and challenging the status quo in the workplace or in society? Nominate HER for the 100 Most Influential Filipina Women in the World Award! Submit your nomination here. The 100 Most Influential Filipina Women in the World Awards (Global FWN100™) is the ultimate showcase of the Filipino community’s most inspiring women in the private and public sectors, who exemplify innovation, mentorship, professionalism, empowerment and leadership. 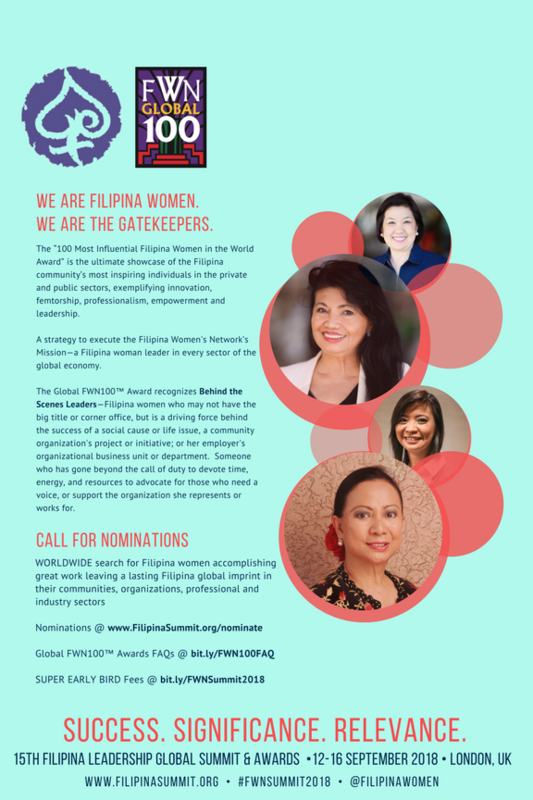 The Global Search will culminate at the 15th Filipina Leadership Global Summit & Awards on September 12-16 at the St. Pancras Renaissance Hotel in London, UK. Please read the Global FWN100™ FAQs before submitting a nomination. FAQs can be found here. Attend the 15th Filipina Leadership Global Summit and join your fellow Filipina women professionals at our annual gathering. SUPER Early Bird Registration ends on 15 March 2018. Register here. Deadline for nominations is on 30 May 2018, 11:59 PM EST. 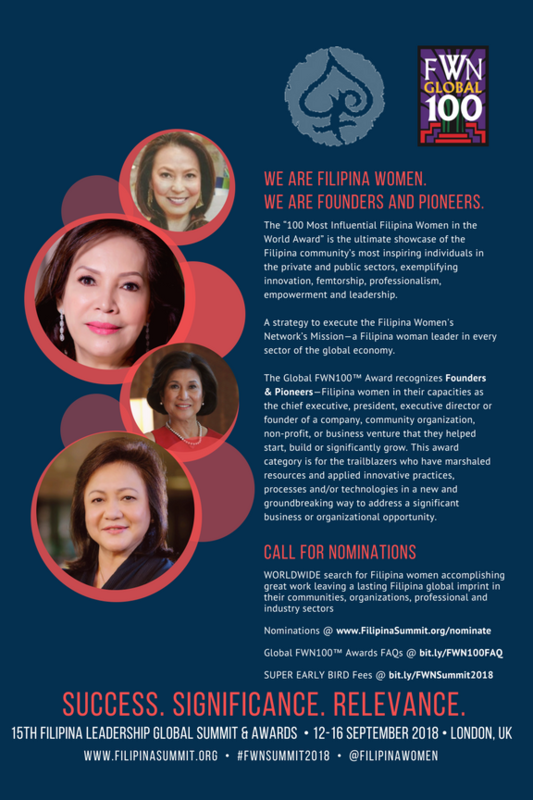 Nominate an amazing Filipina woman today!